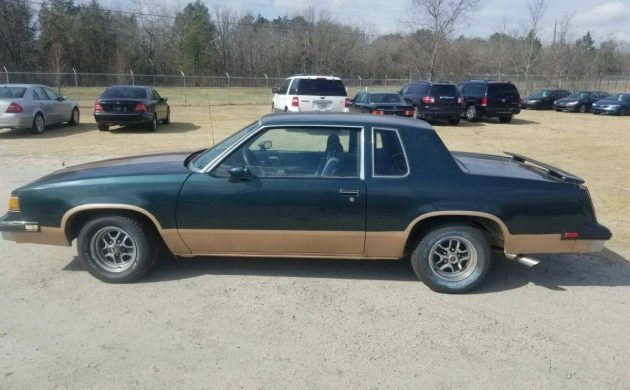 If for no other reason, the 1988 Oldsmobile Cutlass Supreme was significant as it was the last year that the Cutlass was offered in rear-wheel drive form. Whether this fact will have an impact on the future value of that model is an open question, as trends in the classic car market can be quite fickle. After all, I’m sure that during the 1960s, no-one would have believed that the Edsel would achieve the popularity that it has today. This Cutlass Supreme GT is claimed to be 1-of-400 built, but that’s a claim that we’ll examine in a moment. It’s a bit rough around the edges, but it appears to have minimal rust. It is located in Rockingham, North Carolina, and is listed for sale here on eBay. 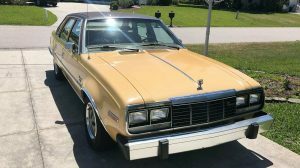 The Cutlass Supreme GT package actually wasn’t an Oldsmobile model in itself but was a dress-up package that was authorized by Oldsmobile, and the work was completed by Tops and Trends in North Carolina. 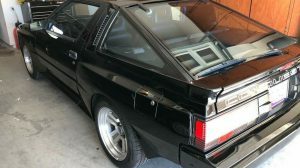 The package consisted of a non-functional hood scoop and rear spoiler, and while some people claimed that these items were a genuine H/O items, they were actually aftermarket components. On top of the standard Cutlass Supreme equipment, the cars were fitted with a floor console and shifter (although column shift was available as a delete option), two-tone paint, either chrome or painted wheels, and a dash plaque which provided the sequence number of the car out of the run of 400 vehicles. This is another area of some misconception because while the intention was to build 400 cars, the final number was significantly less. Most estimates put the final tally at somewhere between 250 and 280 vehicles, as records are vague, at best. Overall, the GT actually looks relatively solid. 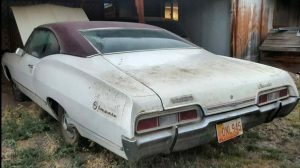 The owner states that the underside of the car is clean, and most of the visible rust in the car seems to be confined to the passenger side of the car. There is a small area in the lower quarter panel on that side, and there is also some appearing along the bottom edge of the door on the same side. The paint itself seems to have held up reasonably well, although it is looking a bit tired on the trunk lid where there’s also a couple of spots of rust. The owner says that there is a piece broken out of the hood scoop, but this piece is in the trunk, and that it could be repaired. The interior of the vehicle is looking quite tired, but it is at least serviceable. 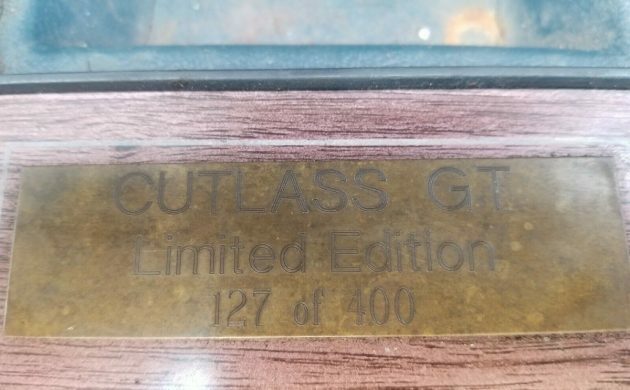 The bonus with the GT is the fact that all of the interior items and trim are standard Cutlass Supreme items, so the parts needed to whip it back into shape are still available. The original radio/cassette player is missing from the dash, while the dash pad is cracked. The owner also says that the car needs a new headliner, while the carpet also looks like it needs to be replaced. Being a Supreme, the car is fitted with power windows, cruise control, and air conditioning, although the A/C doesn’t work at present. What should be under the hood is the 307ci Oldsmobile V8, and this would be backed by a 4-speed automatic transmission. The original engine isn’t there anymore, but it does come with the car. 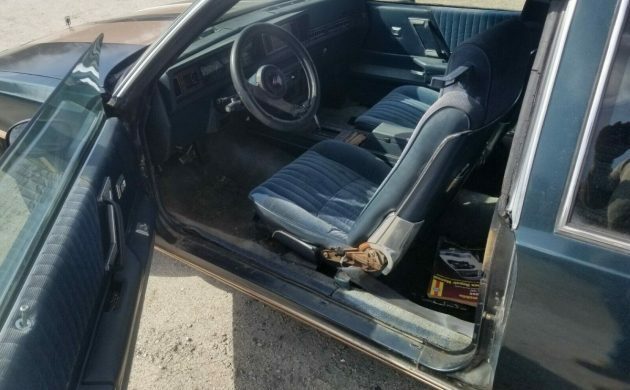 What is sitting there now is a fairly warm Oldsmobile 455. It appears that the engine has undergone a recent rebuild, as the owner says that everything in the engine is new. 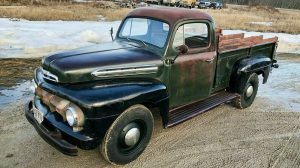 It is also fitted with a new carburetor, a new fan and fan clutch, new Flowmaster headers, a new oil pump, a new distributor, along with new plugs and wires. The owner states that the car sounds really nice. It is also fitted with new tires, and these have only covered about 20 miles since they were fitted. One thing that the car will need is some work on the brakes. Apparently, the pedal is hard, so the brakes may require at least a partial overhaul. 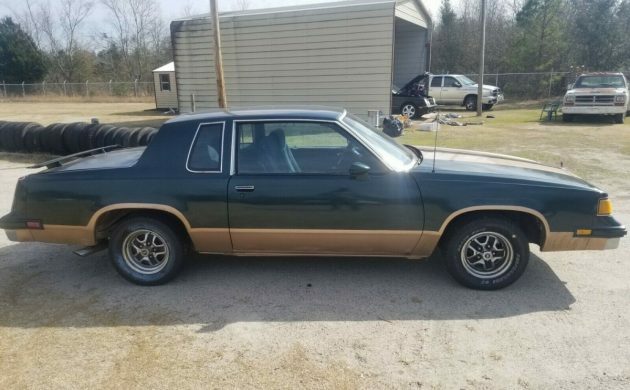 Although there were less than the originally planned 400 Cutlass Supreme GTs built, this is not the first one that I’ve seen for sale in the last six months. The big question really is whether the GT Package actually adds anything to the overall value of the vehicle, or whether it merely constitutes bragging rights. The last one that I saw was not as good as this one, but it did have the original engine under the hood. That one had an asking price of $8,000. This one comes with the original engine but is currently fitted with a warmed-over big-block. Bidding hasn’t been frantic on this car. Well actually, there’s only been one bid, and that’s for $2,000. However, it does appear that the reserve has been met, and there are 14 people who are watching it. 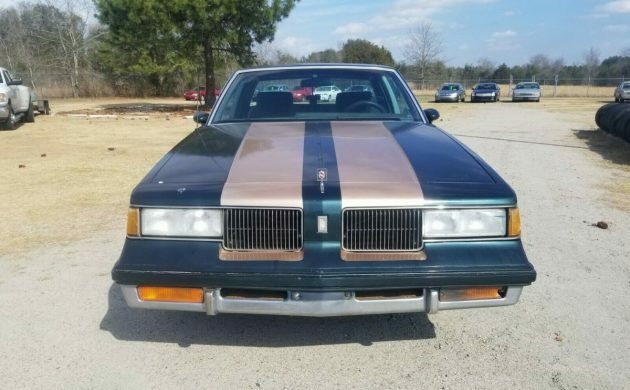 Even if you consider the car as a plain old Cutlass Supreme that has been fitted with a big-block, it does have some potential at that price. Dr. Olds is elderly now and when he was shown a picture of this Olds screamed No!, No! Oh please, No! Original engine is not going to add any value. If you like to smoke tires and surprise people at the stoplights, this could be a good way to do it. If this generation of Cutlass had been offered with a 455, a 4-speed transmission, and a stout rear end it would be the most sought-after car of the ’80’s – a fitting companion to a GNX. No guts, no glory, GM. Where is the non-functional hood scoop the car is supposed to have? It is shown in one pic but not in others. It might be just sitting there. Also, 5.0 usually tells what’s under the hood. It ain’t no 5 liter! I have a pair of 1988 Cutlass Supreme Classics-1 is my first car, has the identical interior only in burgundy from Factory with the chrome wheels. In 87 it would’ve been the Cutlass Salon model. The GT for sale is an interesting car but nothing special- could’ve been Factory optioned that way except for the paint treatment, spoiler and fake hood scoop. This car looks kind of tattered, hopefully it finds a good home. Too many questions come with this purchase . Rust stains around the radiator cap before or after that new fat aluminum unit went in . Is the 200 auto still in it ? A sick 455 will thrash a 200 before you leave the driveway . Dual batteries ran on ONE ground , did some Kidd stick a “system” in it ? Thus cutting speaker holes everywhere ? Or , did it have hydraulics on it before the young master gave up ? And , yes where’s the damn hood scoop ? Eww an egr motor. Even the torque of a smog 455 will make that stock 200r4 come apart violently. No Hood scoop, broken part or otherwise. Was it glued on, and the dot repainted? In most locations this car wold have to be smogged, which this car would fail fabulously. My 1987 Cutlass Supreme is the reason I said when I sold it in 1991 I’ll never purchase another GM product. It was sharp for about a year, then the silver paint turned to more of a charcoal texture. I removed all the trim, sanded the whole car, primed it then shot a gallon of shimron paint on it that had 2.5 times the amount of metallic than the recipe called for. It was beautiful and a head-turner now, but talk about junk from the factory. The 307 started burning oil almost exactly at the 50000 mile mark, then the torque converter began to intermittently fail on longer drives. I had to get a “running start” to make it up hills. Leaky T-Tops too. I liked the factory chrome wheels though, and it did have a visible rear stabilizer bar which looked cool. Rally gauges, buckets, console, sporty steering wheel, but JUNK!! Leave these cars alone folks. The 1988 model was only built to use the leftover parts from the 1987’s anyway. Talk about keeping it real.. I totally agree with your comment and experience owning one. For the life of me I don’t get how anything from this time period has any value. Stickers.. stripes..,bucket seats and a few worthless gauges still add up to nothing..
was painful. If that 455 has any kind of cam in it it could explain the brake & booster issues. Craig, you are correct about the seller’s description. He should have put down the crack pipe and had a literate person write the description. Spun main in 350 76 class supreme broughm. 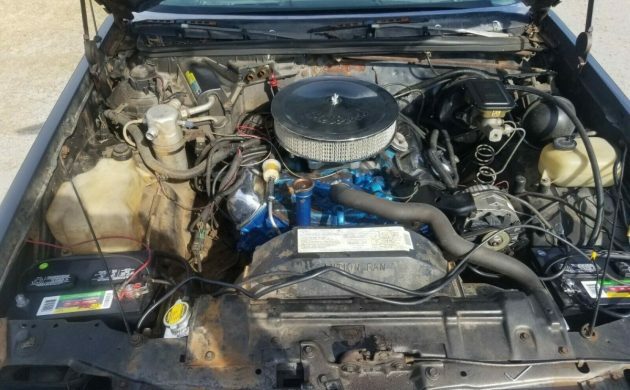 One owner (my mom)swapped 69 455 out of delta 88 (also one owner)electronic ignition,quadrajet off 350,junkyard manifold,headers. Kept 2.41 open rearend. Surprised a few 5.0 mustang, and walked a new 86 vette on highway. Torque Rules. I had an 87 Supreme Brougham. It was the V6 and it rode very well and also looked very nice. I had no problems with it and kept it for 5 yrs. before I sold it. I wish I still had it. Now, I love the 455 so much that I ran one in a camaro that ran 9.90’s in the quartermile. (It was an experiment) I wish this guy would’ve taken his time and did this right. Talk about a street sleeper!